This site will endeavour to contain Sri Chinmoy's literary output in its entirety; currently, there are 1776 books, periodicals and other writings available. Sri Chinmoy gave numerous talks at universities around the world, including Harvard, Oxford and Cambridge, highlighting the central truths of yoga, religion and spirituality for the modern seeker. The book My Ivy League Leaves includes lectures in Harvard, Yale and Stanford. Over the years, Sri Chinmoy answered numerous questions on the spiritual life, offering practical guidance through his simple, direct and powerful replies. These questions have been compiled into volumes such as Sri Chinmoy answers and Flame-Waves. Since his teens, Sri Chinmoy was a prolific poet - many of his famous early poems are contained in My Flute. In later years, his poetry focused on short instructional poems and aphorisms. Sri Chinmoy wrote numerous short stories, which are both illumining and entertaining. These stories include retellings of traditional Indian stories as well as new stories set in a modern context. Among Sri Chinmoy's story collections: Illumination-experiences on Indian soil, and India and her miracle-feast. Sri Chinmoy wrote plays about the lives of some of the great Avatars, such as the Buddha, the Christ, Sri Chaitanya and Sri Ramakrishna, revealing the quintessence of their lives and teachings. Sri Chinmoy's insights help illumine the unity of different spiritual traditions around the world. 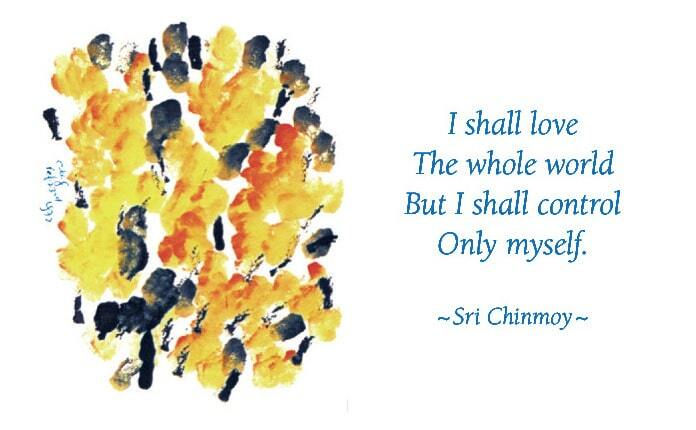 Sri Chinmoy wrote tributes to world figures he deeply admired. These books include poems and talks about the lofty achievements and illumining personalities of these great individuals, such as President Mikhail Gorbachev, President Nelson Mandela and Mother Teresa. While Sri Chinmoy did not write an autobiography, he offers many charming insights into his childhood and youth in books of family vignettes. In his later years in America, he shared anecdotes and observations from his daily life in book form such as The world-experience-tree-climber (from his world travels) and Run and become (from his athletic training). With over 1,590 published books, Sri Chinmoy was a very prolific author. To gain an insight into his spiritual philosophy and teachings, some books provide a particularly good starting point. A collection of essays and talks on the essential aspects of yoga and spirituality. Written in a practical vein, this book offers the newcomer as well as the advanced seeker a deep understanding of the spiritual life. This enlightening book consists of some of Sri Chinmoy's key University talks and lectures on the spiritual life. A compilation of some of Sri Chinmoy's classic writings grouped together by different topics, such as peace, power, and patience. Includes both poetry and practical wisdom. A collection of life-transforming talks given by Sri Chinmoy in a period of 20 days. Each talk is a revelation of some essential spiritual truth, and a contemporary look at the eternal reality. We now have the ability to browse via cover, with many covers uploaded in both English and Czech.